This has been the summer of LOVE with four weddings. The last, in LA, we regret we will not attend. The three in which we have participated were each a breath of fresh air, incorporating the uniqueness of the couple with a practical sensibility of aptly entertaining guests in simpler, more meaningful ways. 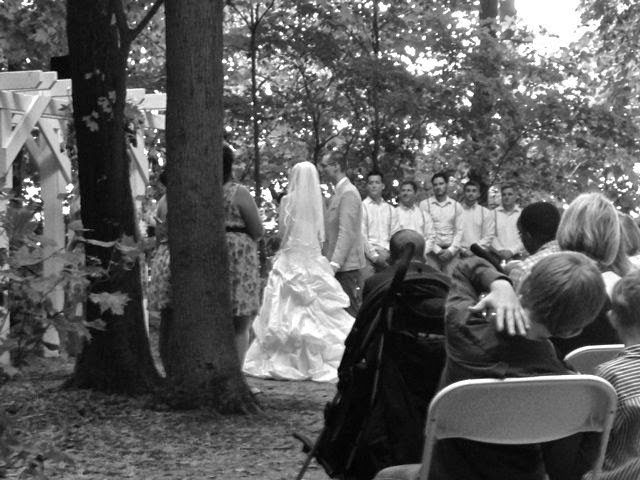 Sunday, we were in the woods for the ceremony, the rain spattering then holding off until we were all safely tucked into the big, beautiful barn before the torrential downpour. This wedding was truly about community. Neighbors actually grew wildflowers from seed that adorned the tables and ceremony arch and a core crew assembled the stunning arrangements. Favors were woven friendship bracelets reading abiding love crafted by Phillipino women working themselves out of prostitution. The bride had participated in the World Race journeying to 11 countries in 11 months as a missionary among the most marginalized people. That’s where she served the women weavers. Like the event we attended two weeks earlier, this too was centered on a farm. The message seems to be back to the roots, making these ceremonies grounded, earthy and very inviting. And then this young couple pushed the envelope a bit farther (than half their guests being children and another chunk beautifully multi-cultural). They asked us to watch a video that really was a sermon. They described it as the theme of the wedding, matching the abiding-love favors. Far from the quiet simplicity of my Quaker Meeting, I was reading text and listening to booming voices on a video monitor. It’s not my style and yet I was compelled to listen because I know the bride and this must be important. The gist of the message was that God doesn’t match us with perfect partners in marriage for a very specific reason: we learn God’s unconditional love when we are forced to forgive the other’s imperfections. This WAS big news. I have learned that you don’t marry intending to change the other, but had not considered how we are moved toward pure love when challenged. Of course it’s easy to have unconditional love for your children (even if you may not like their behavior in the moment), but it’s much more of a journey to love your spouse despite their fault and deficiencies. Let alone how they have to live and love with yours. As I mulled over the message on the drive home, forgiveness as part of that process of living into unconditional love arose. It may have been a remnant of the day before when I attended a metaphysical retreat on opening your heart via Taraka yoga. I had no idea what I was signing up for, just went because it spoke deeply to me. The gentle facilitator suggested metaphysics is the joining of mind and spirit and took us on a journey of 13 steps, where we reflected on our most recent seven-year cycle. Thos steps included some interesting assignments. The first was a half hour of free writing about love in your life in those seven years. Used to journaling, my pen flowed freely to the point of tiring my hand. We had a break, then came back and listed 100 attributes of love. As I rendered more, others labored to get to 100. I believe regular journaling keeps me open to these activities. In three different exercises, we were asked to look at our first, stream-of-consciousness writing and identify a place where we could forgive someone, a place we could ask for forgiveness and where we felt love had been denied. We wrote a letter granting forgiveness, then symbolically burned it. We drafted a letter seeking forgiveness, forgave ourselves looking in a mirror and were given an envelope if we intended to send it. Watching myself in the mirror was very hard, but the longer I did it, the more I softened and quit looking for the flaws and noticed the child of God peering back. I know last week’s challenge by my best friend to post 5 photos on Facebook in which I felt beautiful prepared me for this. Seemingly random, I know Spirit has been at work on me. Once again, we were asked to return to the original entry and identify all of the people we mentioned, one attribute of that person and whether they would have seized that opportunity of denied love. And then it was time for another list of 100, the I-am list. We were each handed a mirror and requested to spend 10 minutes gazing at ourselves, right between the eyebrows. That, was not easy; many of us groaned. The last time I spent much time looking in a mirror was during a shamanic breathwork retreat. Again, I had no idea what I had signed up for, but my young daughter had slipped her purple princess mirror in my purse as a marker of her presence with me. I did take a journey during the session and was forced to look in a mirror. I resisted, assuming I would see evil or ugliness. When I finally screwed up the courage, all I saw was myself. Nothing scary. This time, I further softened the critic in me and began to receive the eyes of unconditional love. Putting the mirrors aside, we were asked to compare our “love is” and “I am” lists for matching words. Boy, was that interesting. We ran short of time, yet I managed to squeak in a quick sketch of a heart inside a circle surrounded by the shared words, the final step. I have since delivered my request for forgiveness, which was met with a hug even though the recipient has not yet read its contents. And I also understand that my partnership, my marriage, is about growing into unconditional love not just for myself, but for another who is also less than perfect. • How do I define unconditional love? • Where do I experience it? • Where do I give it? • How have I been able to forgive myself? • When do I see myself as a child of God? CONFESSION: I have a love/hate relationship with Facebook and, I suspect, am not alone. I am not a junkie because I often find it superficial and a time-waster. But then, I discover a long-lost someone or a very deep thought and am stunned. 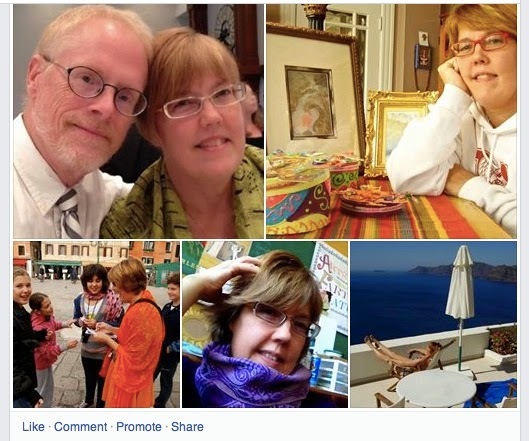 So, when my best friend Kathie proposed a Facebook challenge, I shied away – at first. It was a challenge she'd accepted: to post 5 photos in which you feel beautiful. No way, I just hate having my picture taken, then looking at it even more, I thought. But so does Kathie and she doesn't ask me to do ridiculous things. Maybe I should reconsider. Maybe I could just look to see what I have and then decide whether I post or not. So I looked. I had a few in mind and encountered a few surprises. Instead of struggling to find 5, I had to cut. What probably prompted my compliance was a photo of me and my husband taken a few weekends ago by my daughter at a wedding. I had been struggling with IBS and not feeling especially myself, though this wedding in Iowa and being with family lifted me above the physical plane and back into a wonderfully loving childhood. And I really liked the way I looked in that photo at 55 years old and not, exactly my perfect self. Sometimes we only want to show our best selves and hold out for only that. I am learning that's not living life fully. Two of the five photos I took of myself, playing when no one was looking. I didn't have to perform or feel judged (not that anyone actually was). I just experimented to see what would happen. I felt and looked not only natural but could see my inner self shining through. The one I always feel but am not certain shows externally. As a twin, people always compared us, then I began to compare myself and often didn't measure up. I am learning to undo that negative practice and hoping I emulate that for my daughters. I could recount numerous times I felt less than, but I prefer to remember the times I felt fully present and accepted or didn't care. One of those times is still a shocker to me. In college, I was a little sis for a fraternity. It was a lively social life and a wonderful place where all types of people were accepted. On some level I sensed that when I said yes to the invitation to join. It was such an amazing group of guys and girls: nerds and jocks, artists and physicists, partiers and serious business majors, straight and gay. We worked hard, played hard and grew up together. Many of us still keep in touch. When I was voted little sis president my junior year, I was very honored That spring, I was also named the fraternity sweetheart and pleasantly shocked. I am not the typical sweetheart, at least I didn't' think so. It was a boost of self esteem for which I was extremely grateful. This time I felt I was being seen inside and out by people whom I loved – and trusted. Of course none of this ran through my mind as I began selecting photos for the Facebeook challenge. I knew the wedding photo and one I took a few years ago with my art would by in my top 5. And then I remembered another favorite: me in Venice with a group of Italian kids on a scavenger hunt. I so felt in my element with them and my husband snapped a photo I cherish. Two others hadn't been on my radar until I began to comb through iPhoto. One was another playful experiment with my new phone in my studio and and the last of me lounging on the balcony of a cliff house in Santorini, the Aegean Sea and strong Greek sun shimmering in the background. Beautiful surroundings can permeate us. Ok, I thought, I can live with these and without over thinking it, I posted. Just for myself. Then something magical began to happen. People starting liking the photos and post some lovely comments and I knew, once again as I did in college, that others do see me inside and out. Maybe it's time I should as well. This challenge from my dear friend has helped me see my beauty. Thank you Kathie and each friend who has helped me really see myself. • When have I been challenged and responded? • How do those we love often mirror what we also need? • When have I surprised myself? • When have I felt truly seen? • To what depth do I know how Spirit sees me? As I often worship with my eyes closed, I hadn't noticed Judy readying to speak. She may have been standing. She may have been sitting. She has a beautifully lyrical and commanding voice. She could say just about anything and I would intently listen. She doesn't waste this gift on the trivial. Somehow, magically, she wove the passage about John into a testament about a man largely responsible for me being where I was, at this Quaker Meeting. I won't even pretend to emulate her pure words, but she was speaking about a memorial service the day before for a retired and much-loved Methodist minister, who happened to take on Cincinnati Friends Meeting as an interim pastor for a year-and-a-half in 1998 and 1999. She, her husband and another Friend were surrounded in a sea of Methodists at the service and surprised by this humble person's renown in Methodist circles. Al Tomer emulated love and embodied God's love in human form, according to Judy's vocal ministry. The tears began to roll. I came to Cincinnati Friends at the tail end of Al's tenure, lured by an 18-month-old who woke up one morning saying "Mommy, I know Jesus" and my mother recommending this Quaker Meeting because it was simple and, well, Al was there. The Rev. Al Tomer had been my minister during junior high and high school – and I actually listened to his sermons! Judy's words helped me recognize what a grounded fixture he was in my life and spirituality. I was unprepared for what she said next, that Al was responsible for one of the Meeting's blessings: Cathy Barney and her family. I blushed and gushed with tears, reaching for the Kleenex box and being met with a hand on my shoulder. Two important personal revelations collided: that I had publicly been called a blessing (I struggle with confidence) and that God's hand has so obviously been at work in my life even since junior high when Al Tomer came to pastor Church of the Saviour, my family church. I instantly understood that the work I am called to today, nurturing kids through Artsy Fartsy Saturdays, would never have happened had Al not been serving Cincinnati Friends as interim pastor. He made the transition to choosing my own, adult church and Quakerism smooth. Had he not been there, I believe I would have been too intimidated to go. He welcomed me and eased me in, shepherding my re-emerging faith and spirituality, re-awakened by motherhood and the desire to heal from an accident. And when he moved on three months later and we hired a Quaker minister, I stayed put, happy and content. Judy's husband, Paul, the first person with whom I spoke at Cincinnati Friends, asked me if they'd lose me when Al left. "Heck no," I assured him. How Al came to Cincinnati Friends is an interesting story, one recounted Sunday in worship by Lola, who was secretary at the time. She and Mary, another longtime Friend, approached Earlham School of Religion about an interim. They suggested a retired Methodist Minister and the pair got to work gathering a list of candidates. When Lola called Al, his wife Margaret said he was already pastoring and not available. Lola was stumped and thought she'd have to come up with more names. The next morning, however, Al phoned her and said when he'd gone to bed the night before, he felt called to pastor Cincinnati Friends. Sadly, I was unable to attend the memorial because it was an Artsy Fartsy day, which pretty much exhausts my energy. I was gearing up to transport the kids to the Milford Spiritual Center for walking the labyrinth, meditating and sketching by the river, a field trip for which they have patiently been begging and waiting. I felt moved to also stand in worship and suggest it was Al's fault, really, for my absence at his memorial. 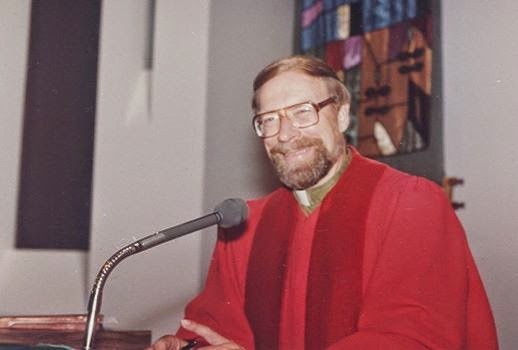 If he had not been faithful to Spirit directing him to Cincinnati Friends, I would never have come, been nurtured for 15 years, entrusted mine and my daughters' spiritual care, learned to listen to God and followed a leading to serve these needy kids. Wow, I can see God directly at work in my life even back to junior high. I am filled with much gratitude and wonder where all else She has been at play. • Who have been your models of love? • How has a spiritual teacher touched your life? • When have you become aware of God at work, the Spirit of Truth, in your life? • What does that awareness spark? • When/how have you understood "you are in me, and I am in you?"